I went down to Washington to meet Chrissy for lunch and took advantage of being there to see some of t he memorials. Washington is a truly beautiful city. There is a lot to see and it is all free. I corrected a German tourist who I overheard saying to a fellow European, “Americans have so little history that they have to make a bigger thing of so short a time.” I pointed out the truth that we Americans enjoy the OLDEST continuous government in the world after only the UK. We have not had a radical or violent overthrow of our government since 1776 and we have lived under the same Constitution – never suspended – since 1788. I asked him just to think about it. I didn’t point out that Germany was not a country until 1871 and that it went through some interesting changes after that. Below is the new office building where I will work in 2009, although I bet I won't get a good view of the Potomac. Below is the same building in April. They are making good progress. Many Europeans have a different and, IMO, mistaken view of history. They fix on places and traditions instead of people. Some people live close to old things but no “people” or culture is older than any other. My mother’s family left the new Germany soon after Otto Von Bismarck's unification thing in 1871. My father’s family left Poland (then subject to the Russian Empire) soon after. I am glad they did. When they came to America, they didn’t just set back the human clock to zero and start over. They added to America’s in a shared heritage. I have been to Germany. We make better sausages in Milwaukee, but they still make better beer. BTW - I hear my great-grandfather used to imply that things were better in Germany. This made him unpopular during World War I. Of course he was not telling the truth. ALL immigrants think that America is better than the places they left, otherwise they would be there and not here. It is true even if they don't want to admit it. Below - Washington still has many big and beautiful American elms. There is no such thing as a culture outside its human carriers. It is not resident in old buildings, the land or anything else non-human. Parents pass their culture on to their children and some cultural traits can be astonishingly long-lived, but each transition produces an imperfect copy. This is great. Otherwise the culture would be as dead as a rock. No two individuals have the same understanding of their culture. We talk about culture as thought it was something palpable, but it really is just a chimera and a very ephemeral one at that. Better to adapt the best things you can find rather than stick only with the adaptations that worked for your grandparents. Even the best things must be adapted. Living people adapt and so do living cultures. I think America does this well. I love our traditions and still feel a kind of excitement when I walk around the Capitol Mall, even though I done it literally hundreds of times. On the other hand, I would not want to be limited to the skills of Washington’s dentist. Above is WWII memorial from behind. Of course, I didn’t bore the European tourists with all that either. Germans usually have good teeth. I thought of change and persistence as I walked past the World War II memorial. It is a new memorial, but it is so very well done and fits perfectly into the Mall that you would think it had been there forever. It commemorates the courage of my father’s generation. Each year there are fewer and fewer of them. Their courage is something worth passing along. There is one simple tradition that seems to be disappearing – bubblers. There are still bubblers on the Mall. There used to be lots of bubblers around generally, now not so much. I suppose they are trouble to maintain. Vandals break them or put gum in the spigots. But I think the culture has taken a small wrong turn in not keeping those things around. A bubbler is an obvious symbol of civic virtue. Everybody gets to have something everybody needs and it is available to all. The symbolism is one of the reason that separate bubblers were so offensive during the time of Jim Crow. Now people sell bottles of water. Everybody carries a bottle of water around to “hydrate”. I would rather have the bubblers. I just finished The Worst Hard Time about the dust bowl of the 1930s. Some of what the author describes applies to Iraq. We get the various different colors of dust and it is almost impossible to get away from it. Below is the American dust bowl. The dust bowl was a man-made disaster caused by the plowing up of prairie grass as farmers tried to produce crops which were not suited by nature to the area. This process was exacerbated by “good luck”. There was a boom in grain prices caused by WWI and the collapse of grain production in Russia (which had been a big exporter) after the revolution there. This coincided with some unusually wet weather on the American high plains and during the 1920s times were good, with bumper harvests and high prices. But later as grain prices dropped (i.e. returned to long term normal), farmers had to put more and more land in production merely to make the same money. It became a viscous (BTW the original idiom is indeed a viscous not vicious) circle with farmers breaking up the sod to grow more grain and growing more lower the prices and encouraging more sod-busting. Then the rains stopped. Subsequent investigation showed that the drought of the dust bowl was not abnormal, but w/o the grass to hold the soil, it blew away. There is a good PBS series on the Dust Bowl, BTW with a good webpage. We learned a lot from this experience. We now have methods that can build or at least maintain soils. The most important lesson is that you have to work within the bounds of nature and there are some things you just cannot do, no matter how attractive or how much you want it. 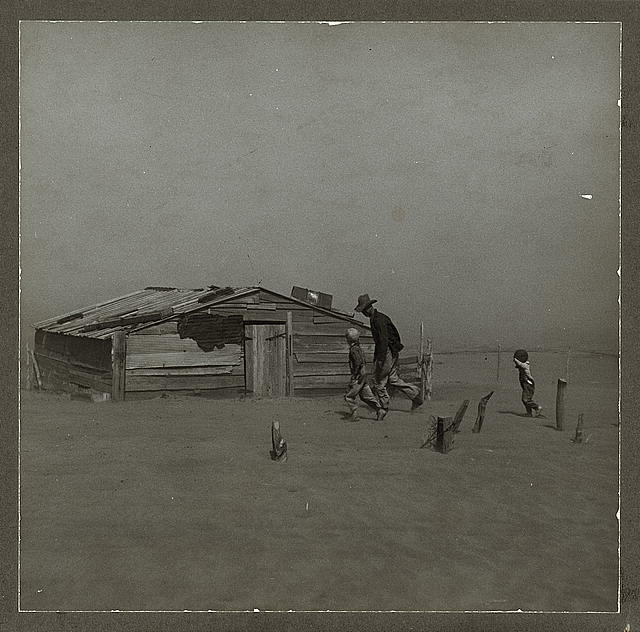 The Great Plains have recovered (mostly) from the dust bowl. Farming there is dry land or irrigated, usually with water from the Ogallala Aquifer, but much has reverted to grassland and many rural counties have never recovered their populations. Iraq has a climate like the Texas Panhandle, only hotter. Anbar gets 4-7 inches of rain in a usual year. Most of that rain falls in winter. I saw a couple of good storms and once it rained all day, but the place is a desert. I wonder, however, how much of desolation is man-made. The dunes in Anbar are dust and dirt, not sand. Plants can grow on dirt, if they have a chance. Unfortunately, people and goats have been working on this place for 4000 years. It would never be verdant, but how much could be restored? We have planned and funded some small scale restoration projects. I don’t know if they will last very long. Local shepherds have incentives to let their animals devour what they can get, even if it means destruction in coming years. I had some grandiose dreams when I came to Anbar. I envisioned a small version of the CCC, an ink blot version. We have had lots of contacts with local farmers but I don’t know if we have done any lasting good. The desert will probably swallow up all we do. Ozymandias leaps to mind. Probably the best thing I did for environment of the desolate region was negative. We declined to fund “emergency feeding” for the local sheep and goats. It seemed cruel, but it really would not have helped even in the short run and it would have caused must more destruction and despair even in the medium term. There are just too many of them for the carrying capacity of the land. They destroy everything green. My Ag-Advisor Dennis, who did a lot of his work and growing up in Texas near the old dust bowl, understood the futility – even perniciousness - of the subsidies. It needed NOT be done. I agreed with him 100%. We took the hard decision and I am proud of it, although I told him that if they ever make a movie about this, we will certainly be the villains. Sheep and goats are desert making machines, but they are cute. Anyway, I recommend the book. About the same time you should also read The Forgotten Man, also about the Great Depression but with a broader perspective. Please see below. I have no personal knowledge of this, but I do know Haditah and the Marines. The Marines I know are honorable. It was a difficult and confusing situation. I have never come close to experiencing what they did, but I saw some of what was left. I side with the Marines on the ground, which is why I am posting what I got in email today. I am contributing. I leave it up to you to make up your own minds. For the last two and a half years Lt. Colonel Jeffrey Chessani, USMC, has been investigated and prosecuted for his involvement in the so called “Haditha massacre” – a massacre that never happened. Now – after devoting 20 years of his life to defend ours’ ─ he faces criminal charges as a result of a legitimate combat action taken by four of his Marines after being ambushed by insurgents in Haditha, Iraq, on November 19, 2005. If convicted, he faces 2 ½ years imprisonment, dismissal from the Corps, and loss of all of his retirement pay. You may have heard that last month a military judge dismissed all the charges against LtCol Chessani. But the government appealed. And yesterday they filed their brief. Jeffrey Chessani is their political scapegoat and they’re embarrassed about the loss. We now have 20 days to file a response brief. Your donation now (click here) sends a message to all our combat troops that you will stand with them when they need your help. Your donation helps keep America strong! It’s hard to believe the lengths to which the politicians in the Pentagon will go to convict an innocent Marine officer. As you read on you’ll know why. After all he has done for his Nation ─ for you and me ─ will you chip in $25 to help this Marine? If you can give more, please do. He urgently needs your help – NOW. Click here to donate to the LtCol Chessani Defense Fund. He has been defending our Nation for twenty years…often away from his wife and children… so that we could be safely with ours. LtCol Chessani served three combat tours in Iraq. He served in the First Persian Gulf War, and in Panama. He is a committed Christian, husband, and father of 6 young children, ages 10 and under. I am certain that when you hear the facts, you will be as outraged as I am about what our government is doing to this courageous and loyal Marine. On November 19, 2005, at approximately 7:15 a.m., a Marine convoy was rolling through Haditha, Iraq — a terrorist stronghold. Suddenly, a roadside bomb went off destroying a Marine Humvee, killing one Marine and seriously injuring two others. The Marines immediately received fire from the ambushing insurgents, who were shooting from nearby civilian-occupied homes. A four-man fire team responded as trained; they cleared several houses occupied by the armed insurgents, and in the ensuing room-by-room, house-by-house gun battle, it was reported that 8 enemy were killed. Tragically 15 civilians also died ─ in urban combat, where insurgents purposefully use civilians as human shields, civilian casualties are tragic, but not uncommon. In fact, sometimes the insurgents themselves kill civilians to achieve a propaganda victory by blaming the Americans. LtCol Chessani was the battalion commander of these brave Marines ─ the 3rd Battalion (“The Thundering Third”), 1st Marines—one of the most decorated units in the history of the Marine Corps. As the Battalion Commander, LtCol Chessani was responsible that morning for approximately 2000 American and friendly Iraqi troops in an area of operations just about the size of South Carolina. He immediately reported the deaths of the 15 civilian Iraqis to his superiors. Not one of LtCol Chessani’s superiors hearing of the 15 civilian deaths ─ including top generals ─ considered it unusual. Not one ordered a further investigation. However, several months later, an inflammatory Time news article accusing the Marines of massacring innocent civilians caused public hysteria. The story was planted by insurgent propaganda operatives who knew too well that the liberal anti-war media hungered for such stories. Anti-war Congressman John Murtha, who wields tremendous power over military appropriations, jumped in and echoed Time’s story. He appeared on major television networks and publicly accused the young enlisted Marines of “cold blooded” murder and Marine officers of a “cover-up.” He blamed it all on the stress of being in Iraq too long. Incredibly, these accusations were made even before the investigation was completed. It’s clear ─ the government has turned the prosecution of Jeffrey Chessani into a never-ending persecution. The trumped-up charge: failing to properly report and investigate the November 19, 2005 incident. The government is doing everything it can to convict LtCol Chessani. He is the political scapegoat they must convict to satisfy Murtha and the press. The vast resources of the military are at its disposal. The number of military investigators is virtually limitless. Government prosecutors can go anywhere, talk to anyone, and get anything, all at government expense. The Marine command structure is mandated to cooperate. So far, the government has spent millions of our taxpayer dollars, employed over 65 Naval Criminal Investigative Service (NCIS) agents ─ the largest investigation in that agency’s history ─ and granted immunity to scores of witnesses, all in their attempt to make Jeffrey and the “Haditha Marines” political scapegoats. But I’m sure you know that the impact of this case reaches far beyond the personal tragedy and injustice to Jeffrey and his family. You know it will drastically curtail the future ability of our combat men and women to defend our Nation. Regardless of how you feel about the war, LtCol Chessani was in Iraq because his country sent him there. He defended us, now we must defend him. Just to give you an idea what this Nation has lost by the prosecution of LtCol Chessani, and why he deserves your support, I want to give you a few excerpts from his official Combat Fitness Report. One distorted magazine article has devastated the life and family of this patriotic Marine officer… and could adversely affect our military for years to come. This case is about how our military fights and will fight in the future. LtCol Chessani has willingly answered the call to serve his country. That’s why he deserves the support of every Patriotic American today. P.S. It is urgent you donate now. We have 20 days to file our response to the government brief. We must also prepare for the inevitable trial. The successful defense of Jeffrey Chessani is vital to the security of America and to all our military personnel we place in harm’s way. Your donation is tax-deductible. P.P.S. Please share LtCol Chessani’s story with others who will realize the gravity of this important case. Click here to forward this article to a friend now. I will go back to Iraq at the end of this week for my last two months there. I have been thinking about how I can continue to add value up until the very end. The two hardest parts of any posting are the first month and the last. In first month you are overwhelmed trying to learn the new place, the new job and how to work with new colleagues; in the last you are trying to stay relevant, not check-out mentally before you leave physically and continue to plant those seeds you know you will never see germinate. Much of my energy will be absorbed by the transition to a new team leader. It helps that my successor, Robert Kerr, is an experienced diplomat who has already served in Iraq. We will overlap for at least a week - long enough to pass along my knowledge, but not my bad habits. Beyond that, my team works autonomously. We all like to think we are indispensible, but I know from experience that soon after we leave a posting we gone like the snows of past winters. We do our part in our time and when our time is done we do something else. That does not detract from the importance of our duty. Each of us is a link in the chain and as the old saying goes, a chain is only as strong as its weakest link. I am gratful that I had the opportunity to do my part. We need to build on the success given to us by the surge. We can be grateful that we didn’t listen to the advice of the surge opponents a year ago, but maybe some of their current advice isn’t so bad. A detailed timeline independent of developing condition in Iraq is just plain stupid, but an aspirational timeline, one that reiterates the U.S. desire to leave, may be a good idea. In my corner of Iraq, we have begun already. The Marines are gradually drawing down. They are responible for the peace we now enjoy, so leaving is tricky for all sorts of big reasons. For us, their drawdown has the practical effect of giving us fewer travel assets, i.e. helicopters and convoys. We also see our Iraqi friends are willing and able to take on more of the responsibility for their own development. The transition is tricky. Some of the locals have come to see us as a font of resources. They think it is easier and better to get us to do something than to ask their own government or do it themselves. We have to change this attitude and I have been trying to wean them off our largess, at least as pertains to our ePRT. We don’t do anything w/o a local contribution. The days of us doing for them are over. We are currently in the partnership mode and I look forward to the day coming soon when they will do for themselves. I hope with some U.S. investment and participation, but that will be private. If we don’t succeed, I worry about the moral hazard. When people get used to unearned entitlements it leads to dependency and indolence. Beyond that, they come to despise those giving them the benefit. Generosity is harder than it seems. I think it has something to do with reciprocity. W/o self respect, people cannot respect others and they cannot build self respect if they feel that they are not making a contribution. Giving w/o expecting anything in return can take away the recipients’ self respect. Their contribution need not be directly proportional. It may consist of only the promise to do something for others in the future, but the donor has to insist of something, a contribution – reciprocity. Otherwise there is a moral hazard that leads to pain for both donor and recipient. The old saying that it is more blessed to give than receive is incomplete. The best for all around is generous reciprocity. Fishermen near Hadithah are pulling bigger fish out of the Euphrates than anybody can remember. The fish got a chance to be so big because locals had been unable to fish during the late insurgency. Coalition forces had limited or banned river traffic to prevent terrorists from using the river as transportation and a way to get away. With the more stable situation, the ban was been lifted, but fishing did not return to its previous levels, despite the size of the fish population. Why not? We thought of the obvious reasons, maybe the boats were not in good repair or that people were still afraid to take to the water, but this didn’t seem to be true. People were fishing, but not so much. They were fishing for their own or for very local consumption, but not for market. Then we identified to missing link. It was not the boats, river, fish, fish markets or fishermen. The missing link was ice. Fish are very perishable. You can catch that big fish, but it is probably not a good idea to buy it or eat it after it has been sitting around in 110 degree heat in the sun all day. W/o ice, fish mongering is limited to places very near the river where live fish can be maintained. There was an ice factory nearby, but it was not in operation. CF helped get it up and running and now fishing is returning. All this makes our plans to help with fish hatcheries in Anah and Hadithah more urgent, but the hatcheries would have been ineffective and maybe even harmful if the ice problem had not been solved. The lesson for me was a reminder of bottlenecks and how well the free market works if it is allowed to do so. We (in this case essentially bureaucratic planners) didn’t think through the whole system. No planners really can. That is why the market works so well. Individuals or groups identify a need and they fill it – IF they can. The authorities’ role is not to do, but to enable. I think we did the right thing in enabling rather than providing. Independently, CF are contracting with local firms for ice, rather than making it ourselves, which we are more than capable of doing. This is helping build an ice infrastructure, which will be in place after we leave. Ice is a big deal in this hot climate. I am glad that we caught on in time. You accomplish big goals by a combination of applying pushing energy and removing obstacles. It is tempting just to push harder because you have more ostensible control, but often the obstacle removal is the way to go. Buying boats & nets, training fishermen etc would have looked good on our reports, but removing the obstacle and letting them do it themselves was the true key to success. As the old Taoist wisdom advises, the best way to accomplish a task is when the people say, "we did it all by ourselves." FYI - In case anybody notices, I am still in the U.S. and this post is out of sequence. I wrote it a couple weeks ago. I just forgot to post. The pictures are old ones too. The top one is fishermen on Lake Qadissya and the one above is Lake Thar-Thar. First ban all leaf blowers. I went running on a perfect summer morning in N. Virginia, with clear air, green plants and temperatures in the middle 70s. Into this arcadia intruded a landscape crew of fools with leaf blowers, no doubt paid for with my property tax dollars. A leaf blower is a small thing, but considering all the impacts and connections it is a metaphor for life's more general conundrums. With its inefficient small engine, the average leaf blower makes more pollution than a new SUV. If you are downwind, you can smell them almost as soon as you can hear them. Their noise pierces the peace of a leafy neighborhood. They are almost always operated by low-paid workers, often illegal aliens. Worst of all, they don’t really work. The distracted worker walks along the path carelessly spraying air to move leaves and clippings a few feet, while raising dust and disturbing the peace. If you come back a few hours later, you can see no evidence of their work. Not all wind is man-made by leaf blowers, after all, and nature redistributes the clippings in relation to prevailing daily wind patterns. The leaf blowers, in other words, are doing nothing - badly. What would happen w/o leaf blowers? Eliminating the noise, fuel waste and pollution is good. Most of the work need not be done anyway, so there is not much loss. Landscape firms could hire fewer low paid workers. For those rare times where the leaf blowers do some good, there is nothing that a leaf blower can do that a broom or a rake cannot do better. It is not like John Henry racing the steam drill. A leaf blower is a labor saving, not a labor enhancing device. Burning a few extra calories through added physical effort wouldn’t hurt the operators. It is good all around. How many “leaf blower scenarios” do we have in our society? Things that we could not only do without, but whose elimination would make us better off? Think of how you have to take a sweatshirt to theaters and grocery stores - in summer because of the excessive air conditioning. We can all think of many. An active manager looks for things to add to his agenda every day. A wise leader looks for things on the agenda that can be consolidated or eliminated entirely. Unfortunately, our bias is to reward senseless activity, even when it is producing no results of even negative ones. We do not recognize that sometimes we are failing because of and not in spite of our best efforts. Usually a thoughtful response will do less but accomplish more. I think the key to understanding what should be done is knowing where you want to be. It is too easy to identify a problem, propose an inappropriate solution and then blame others when it doesn’t work - what most politicians do most of the time. Some problems are not solvable and have to be endured. Some problems cannot be solved with the tools available. Some problems are not solvable at this time but may be easy to sort out as conditions develop. Most problems are not problems at all. They have to be neither endured nor solved and safely can be bypassed or ignored. They may go away by themselves if left alone or trouble us no more if we make minor adjustments. BTW, any problem you can easily afford to buy your way out of is not a problem; it is merely an expense and don't spend a dollar fighting a nickel's worth of trouble. It is useful to think about which are which and allocate time and resources accordingly. If you think about where you want to be rather than how to solve each problem you encounter, you come up with better solutions… and you understand that inventions such as leaf blowers don’t really get you there. My grandiose title may be just a little misleading, but the mind works faster when you are running and the leaf blowing fools stimulate perhaps more lesson than the experience has to teach. PS - If you want to write to me but not have your response posted as a comment, just make a note at the top that it is just a private note. I see all the comments before posting. The kids like Busch Gardens because of the roller-coasters. I like them too, but good amusement parks are places where you see experimental urban planning techniques and methods of cueing control. First the amusments. Along side is Espen arm wresting the machine. He won, but it still cost 50 cents. We went on the new ride called the Griffon. It has a fantastic vertical drop. Roller-coasters keep getting better. I recall the first time I went to Busch Gardens about twenty years ago. The best they could do back then was the Loch Ness Monster. My favorite is Apollo’s Chariot because you feel like you are going to fly out when you hit the high points. The park is designed around a European theme. They have Italy, Germany, England, Ireland and France. Busch Gardens in Florida has an Africa theme. Below is the Ireland part of Busch Gardens. Now for the urban planning. Amusement parks create the illusions of space and distance. They do this by using travel time and changes of venue. Most of us cannot measure straight line distance very well. Instead, we use the proxies of time and effort. We also notice changes in scenery, especially when we pass through some kind of threshold such as a bridge, arch or gate. When you walk between and among the various parts of a well designed park, you never get to go the straight line. You often have to take some kind of transportation, usually a train, that makes it seem like you are embarking on a journey. You also cross a lot of thresholds. Bridges, arches and gates are placed strategically to make you think you have entered a different place. It works. Below - there are nice gardens at Busch Gardens. One reason I like that park is that it is pretty. Amusement parks are some of the places where various methods are best applied, but they are the basis of all good urban and park planning. I read a very good book re called A Pattern Language where the authors tried to figure out the patterns that make landscapes and cities pleasant. The book is full of suggestions that apply across cultures. I found a website re. You have to be member to get all the benefits, but it has some nice picture. Below are Espen and Alex, practicing their usual looks, in Busch Gardens England. At the risk of sounding like a philistine, IMO most great cities have that amusement park atmosphere and were essentially built with that same idea in mind. That is why people like to go there. Go to Venice, the Vatican, Paris or Vienna and tell me you cannot see that. It is just that in those days the amusements were for the princes and fat cats. At first I just thought amusement parks copied these places, but the closer I looked the more I understood that these were indeed amusement parks only on a grander scale and had developed more snob-appeal from just being around a long time. Just as in a modern Disney World or Busch Gardens, patronage allowed architects, engineers and artists to experiment with new forms. If the popes or the Medici could have built a roller coaster, they would have had one. Imagine them whooping it up on the drop. A roller coaster is a wonder of engineering and physics and requires an understanding of human perceptions and psychology. It is no small thing, physically or intellectually. I don’t doubt that Leonardo da Vinci designed one or two of them, but like the other things he drew, they didn’t go into production. Below is the wisteria. Grows fast. Notice the arch as you pass from one section to the next. For example, a path with uneven width (i.e. with wider spots and curves) is more appealing than a straight road. People all over the world like structures with galleries or porches. A well designed house offers a transition area from outside space to inside space. We are attracted to houses with a sheltering roof. A room with a corner with windows on both walls is nicer than one with windows only on one. Most of the things are obvious WHEN they are pointed out. Unfortunately, many of our modern cities violate almost all the precepts of a comfortable place to live. In recent years, we have designed our cities for the convenience of the automobile and make humans second class inhabitants in our cities. It doesn’t have to be that way and we can learn from what they do at quality amusement parks and public gardens. Below is Busch Garden's Italian street. Some communities are being designed with the human principle in mind. Unfortunately, they tend to be only upscale places where ordinary people cannot afford to live. They also tend to run up against zoning rules. Recently, we also have the added permutation of the Americans with Disabilities Act. Most of the nicest places in my favorite cities such as Krakow, Vienna or Istanbul would never pass the tests of accessibility. In theory, you could build a neighborhood as charming as some of those we find in great old cities, but modern rules would not permit it. However, you might be able to get an erzatz version as in Busch Gardens. That is not so bad. Below are Alex and Epsen entering the German section. Notice again the distinct entry. Re housing, I read an article in this month’s Wilson Quarterly about housing. The author was Witold Rybczynski, who wrote a very good book called City Life that I read a couple years ago. Witold Rybczynski says that housing is so expensive because of all the restrictions governments place on land use and building requirements. Places where the red tape is the strongest, such as the New England and the West Coast, have much higher home prices. It is not simply a matter of greater demand, but also of artificially restricted supply. Builders are complicit in this, although you can see why they would be almost forced to do it. If a parcel of buildable land costs a lot, it just makes sense to build a big, expensive house there to make it worth the effort. Many people have more house than they need, but they have been convinced that they need even more. I recommend both the article and the book. Unfortunately, neither is available online, so you have to look at them in the old fashioned paper way (Wilson Quarterly is worth the subscription, BTW), but I did find a good interview with author. Below is Roman Rapids at Busch Gardens. You get wet, but it was hot so good. Only Alex and I went. Mariza took the picture. Espen paid a quarter to try to squirt us from the side, but missed. PS – this is a little off topic, but as long as we are talking re things that make life work, I also found a good article re freshwater. This is the link. Below - the kids don't like to have their pictures taken. IMO - the recuperation part of R&R is getting a chance to think about things besides work, so this is what I have been doing. Above - Mariza and Spong Bob. Below - Espen got a gum package that gave a shock when you tried to take on. He couldn't understand why he got no takers. We are all suspicious of him bearing gifts. The opposite is also true. Below is the Griffon roller-coaster at Busch Gardens. It reminds me of our perceptions of Iraq over the last years. Iraq is getting play in the news again, but the narrative is wrong. Some commentators – covering for their earlier dumb statements - disingenuously say that we don’t know what would have happened if we had followed the defeatist advice in 2006 and pulled out instead of surged. Anybody who has been to Iraq knows that we would be in a big mess today. The proper answer for the erstwhile surge opponents is to say that they were seriously wrong last year, but that they see the error in light of events and will work with conditions to take advantage of the success brought about by policies they opposed. I certrainly would not hold their earlier mistakes against them, but I don’t think I will hold my breath waiting for the truth. The media correctly points out that w/o the Sunni Awakening and the decline of the Shiite militias we would not enjoy the success we do today. Lots of thing contributed to success. W/o the surge, however, Al Qaeda would have cut the head off Sunni leaders, as they did in 2005, and the Shiite militias would never have gone into decline. When you win, you get some of the things you want. That is what winning means. Some people just cannot understand joint causality and that some conditions are indeed necessary but not by themselves sufficient. I have lived in Anbar for awhile now and met people involved in the Awakening. They hate Al Qaeda with considerable passion and we certainly could not have defeated the bad guys w/o their help. But w/o our help, THEY could not have defeated the bad guys either. Our friends would have been isolated and killed individually or in small groups, along with their families, and others would have been intimidated into silence. I don’t have to speculate about this. We saw that such things happened in 2005 and we still could see them happening on a smaller scale even in the time I have been in Iraq. Let me be as blunt as I can. The surge worked. Those who opposed the surge were wrong. I feel justified in being so nasty because of all the defeatism and negativity we had just a year ago – about the time I was deciding to go to Iraq myself. I will not accept that those who told people like me that we were stupid for thinking we could win in Iraq – and chumps for volunteering - can now pretend that the success in Iraq would have happened anyway. I believe in looking to the future and I don’t dwell on this to justify the past. Historians can sort out the details in the fullness of time. But we are still in the midst of this project and we have to keep our eyes on the ball. AQI and the bad guys are on the run, but they are not defeated. They are like an infection that has been weakened by penicillin. We are feeling good now and it is tempting to declare that all is well, but if we stop before the job is done, the disease will return, stronger and more deadly. The success of the surge is giving us the options of bringing home troops – in victory – and of getting the Iraqis to share more of the burden. But it is important to remember HOW we got to this point and don’t pretend that it was just luck. Re Afghanistan –Foreign fighters that until recently headed to Iraq now are on their way to Afghanistan. Why? Because they know they are defeated in Iraq. If WE had been defeated in Iraq in 2006, they would still be going to Afghanistan, but with greater confidence & resolve and in greater numbers. Iraq and Afghanistan are not the same war, but they are linked. Al Qaeda & other terror organizations send fighters and bombers to both places. Foreign terrorists fight us where they think they can hurt us. That WAS Iraq when we were weaker there. It may be Afghanistan now because our success in Iraq has made it too hard for the bad guys there. It could also, BTW, be New York or Washington. We control them by opposing them. That is just true. If we keep the imitative, we have more choices about WHERE we fight them, but we do not have a choice about IF we will fight them. People who support extremists respond to the same sorts of pressures and incentives as other people. When being a jihadist is easy and it looks like success is at hand, lots of people want to volunteer or at least be on the winning side. As it gets harder or more dangerous, this support dries up. Fighting terrorists does not create more IF it is done properly. Please see my note from yesterday. Extremist ideologies decline only AFTER they have been defeated or discredited. Nazism didn’t decline by itself. It went into terminal decline after it was defeated by force of arms. Until then it looked like the wave of the future. In 1941 things looked different than they did in 1945. A similar dustbin of history fate befell Soviet Marxism. Although in their case it was primarily an economic and political defeat, these forces were backed by forty years of resolve and strength on the part of the U.S. and our allies, without which Soviet communism would have blotted out the sun of freedom over a much wider area for a much longer time. Why does anybody think extremist jihadists would go away without a fight? They are standing on the edge of the precipice. Let’s make sure they fall off. BTW – when we do succeed in this endeavor, let’s not think it is the end of history. We went down that path in the 1990s and it didn't work out. I recommend a superb interview about Iraq with John Nagl, who helped write the COIN manual. It is on Fresh Air on NPR. This program sits on the soft left side of the radio spectrum, which is why this interview is so interesting. The host obviously is a light-weight compared with Nagl. You can hear in her voice and demeanor that she knows that too and is impressed with his knowledge. She really seems to have learned something. Her questions are sometimes leading and simplistic but his answers make it all work. Getting accurate news out on a venue such as Fresh Air is useful. I suspect that many of the listeners are as badly in need of the education as the show’s host. The popular stereotype of the Iraq conflict and the people fighting it are out of whack with reality, but too often on shows like this you hear “experts” repeating them in a self-sustaining circle. A dose of reality will be a breath of fresh air. Anyway, this is the link to the John Nagl Interview. Below is the Marine Band playing at the Marine Memorial in Arlington. They play every Tuesday evening during the summer. I went to see them last week. The picture is not related to the rest of the post, but I thought it was a good picture. I minored in anthropology as an undergraduate. I don’t think about that much anymore, but an article from AEI reminded me of the usefulness of this sort of outlook. Anthropologists study cultures and the interrelations within and among them. This is useful in Iraq and Afghanistan as we try to apply leverage to help those places overcome the damage of insurgencies and terrorism. I have spoken to anthropologist studying the cultural landscape of Anbar and we are always looking for better ways to understand the people we work with. We call it “human terrain” and knowing the human terrain is as important as understanding the physical terrain of a battle space. It saves lives and makes us more successful. It just makes sense. The article I linked above is about an anthropologist who was recently killed while on duty in Afghanistan. This guy was a hero. What surprised me was that some professional anthropologists disagree. Some even say it is some kind of ethical violation for anthropologists to use their skills to help with human terrain projects. I think maybe they have been watching too much Star Trek and they think the prime directive is applicable on our planet. It is one of those examples that shows that you can get a PhD and still remain a fool. We apply our education – history, anthropology, business etc – to do our jobs better. It would be unethical not to do so, IMO. That is one of the purposes of education. I cannot believe that there is a controversy about this among some academics. Are they trying to prove that what they teach in the ivory tower really is useless? The article I mentioned refers to William Francis Butler who said that a nation that insists on separating its soldiers and its scholars will likely find its fighting done by fools and its thinking by cowards. In our modern America it looks like we have given fools some of the thinking jobs too. Social "sciences" such as sociology, anthropology and psychology are not sciences in the precise sense of the term. That does not mean they are not worth study. On the contrary, the disciplines used in these fields can help channel thought and help in the art of living life. But social scientists have no right to stand apart from their societies in a way we might tolerate in a practitioner of a hard science. Society IS their business. I studied history & management in school, but I didn’t leave it in the classroom. Whenever possible, I like to test assumptions and theories in light of actual events in the real world. Thinking improves action and action improves thinking and the test of a theory is its ability to predict outcomes in the real world. No theory accurately applies to all aspects the real world, but some are better, more predictive, than others and all can be improved in light of experience. I think that – the real world experience - is what scares some academics. They want to protect their theories and their phony-baloney status from the intrusion of reality. That is why they criticize colleagues who participate in reality, no matter what rationalizations they offer. The best professors I recall from my studies were those who had worked in business and/or consulted extensively. They were a lot more reasonable than those who rarely or never ventured out. But the pure academic types often looked down on experience - silly, but true. It evidently still applies. Let's hope the "purists" are not too strong. Barack Obama is going to visit Iraq. This is a good thing. He is an honest man. After he sees for himself the progress we have made, he will have to come around to a more sensible policy on the subject. Let the dogs of the left howl. We have to look to the future. I get annoyed at all the pea-brained fools who want to relive the events of 2003. Yes, if we had it to do all over again we would make a different set of mistakes. I think it was a good thing to get rid of Saddam Hussein, but no matter what our opinions of the past, we live in the here and now. We can make decisions only in the present that affect the future. In the here and now we have an astonishing opportunity. The next president, Obama or McCain, will have options. This is what the success of the surge has achieved. American resolve and courage has given the next president a victory. The sooner we all recognize that, the better we can build on that success. We can now withdraw some troops; we can now get the Iraqis to pay for more of their own reconstruction; we can further humiliate Al Qaeda. These are the things victory gives us. We achieved this victory because of our perseverance and hard work. Already I notice that the media is implying that the turn-around (when they even notice it) results from luck or something we could have had w/o all the hardships if only we had been nicer to some of our adversaries. Before a big & difficult change, people say it is impossible. After it has happened, they claim it was inevitable. This is a perniciously silly idea. Giving up in 2006 would have been a disaster. If we had relied on the kindness of the Iranians, Al Qaeda or the various regional bad guys we would be bloodied all over the place. These guys have no history of moderation or generosity. They stop only when they hit something stronger and more determined than they are. Americans are generous in victory. That is what secures peace. But you cannot be generous until you have something to be generous with. In other words, you can give peace a chance only AFTER earning it. I will be watching the news very carefully. Lord knows, it will be easy to follow Obama’s progress since he has taken all the network news anchors with him. I eagerly await his turn around in Iraq policy. I look forward to seeing how it is done. I expect to learn a lot re spinning. No matter what, however, it will be a welcome development. It is sort of like what Viktor Laszlo says to Rick Blaine in Casablanca. "Welcome back to the fight. This time I know our side will win." I call it our agricultural enterprise. I never want to retire, but I want to be working at something special from the time I leave officially paid work and when I take the road to glory. That is why I am acquiring forest land. Eventually, I would like to have an integrated enterprise including forestry, fish farming, hunting leases and maybe some limited livestock production. I hope the kids will take an interest too. This is a long way off and it is more of an aspiration than a plan, but we took another step today when we got another 115 acres of forest land. Added to the 178 acres we already own, I figure we are around 1/3 to the goal. The new property has 86 acres of loblolly pine planted in 1996. It is excellent stand, only a little too thick, but I have not seen better at this age (except for a perfect stand of trees along HW 48 just south of US 1). The owner who planted it was Union Camp. During the 1990s, they had a lot of good foresters working for them who did an excellent site preparation and planting. The trees you see in the picture (with the truck for comparison) are tall and healthy. This is an outstanding plantation of trees. I thank the downturn in the property market and the low price of fiber for this land being available. There is a minor risk from the southern pine beetle until first thinning, which I think we can do three years. a couple years ahead of average. Then we will apply biosolids & do a prescribed burn. I expect the second thinning chip & saw about seven years later. Running through the property are power lines. This is a good thing. It makes it less desirable for development and provides a long open area good for wildlife. I can manage that space for herbaceous plants. There just can be no trees. Eight acres are taken up by this easement, which includes an access road. The rest of the property is a seventy year old hardwood forest we leave alone to ensure water quality. This property has no permanent streams, but the low lying areas feed springs and are watercourses in wet weather. We also inspected the precommercial thinning and wildlife plots on the first piece of land. I am calling this property Chrissy's Pond. I have not built the pond yet, but I have a couple of good places. This place has two spring fed streams and big creek. Below is one of the wildlife plots. The clover and chickory are under those ragweeds. It needs to be mowed. This is more fun than being in Iraq. Above is the thinned forest on the CP property. The spacing will protect them from beetles and cause a growth spurt. These pines were planted in 2003. Before this treatment they were a bit too thick and there was significant competition. I think they should be just a little bigger. At some places on the property, they are. The hardwood forest at the edge of the picture is beech-oak-tulip poplar. That is my favorite part of the land. Below - today. This is SR 623 looking south. Both sides are our up to the trees at the horizon, which is Genito Creek. On the east side of the road we only own about 100 yards from the road, not enough for forestry, but I can keep the road from being developed now and forever. Not that it is a big possibility way out here. Al Gore buys them; so does Madonna. Green celebrities and politicians assuage their guilt with carbon credits. It works a lot like selling indulgences for sin in the medieval church. The jet-setting celeb can buy a carbon credit to make up for his/her sin - profligate use of energy - and still be a member in good standing of the church of the environment ... and not have to use less energy. Ever wonder where those credits come from? Some will come from me. The guys who did my pre-commercial thinning have been working on this. They say that I can sell the carbon my trees take out of the air on the Chicago Climate Exchange. Young pine forests like mine take a lot of carbon out of the air and they figure that I can earn about $15/acre/year. You have to enter into a 15 year contract to grow trees and not develop the place for fifteen years. Since this fits with my plans anyway, it seems like a pretty sweet deal. I even get a little more money for applying biosolids (which I already plan to do next year) since that makes the trees grow faster. It is a win all around. I get to grow my trees as I planned and get money. People like Al Gore & Madonna get to feel virtuous and environmentally friendly when they buy the carbon sequestered by my loblolly pines. There is an even more interesting permutation. Scientists at Duke University have been studying loblolly pines in a higher CO2 environment as they expect with more greenhouse gases. They grow significantly faster and stronger, so my trees are both removing excess CO2 and growing stronger while doing it. I don’t feel too hypocritical. I know. It is a bit of a scam for fat-cat celebs, but it does some useful things. It makes some eco-friendly activities more valuable. In my particular case it will not change my behavior, but I can well imagine cases where a couple thousand dollars a year might help encourage someone to keep his land in trees and/or do better forestry. The income from carbon credits will pay the property taxes, which are a burden on some of my neighbors. Besides, we forest landowners have been giving the Al Gores of this world a free ride too long. It is about time they pulled their own weight and we were appreciated. The way I see it, we all like the green. Below 2006. You can see the taller trees in the background in both pictures. I have circled it here. I can no longer take a picture from this spot. You cannot see the forest for the trees. Below - most of S. Virginia is pine covered. This is I85. It is like that for many miles. Lots of carbon credits available. Of course, older forests do not take as much carbon out of the air and an old growth forest is pretty much carbon neutral. I love my trees and am proud of their growth. If you look at the sets of pictures in the text, you can see how well they are doing. The pictures with the smaller trees were taken in 2006. Only two years later it looks a lot more like a new forest. I also bought another forests today. I will write more in the next posts. I have always loved trees. Thanks to energy guzzling celebrities, it pays better. Chrissy and I were talking re our kids and friends and quitting. It is always easy to advise people to just keep on going, don't quit. But is that good advice? Below is the family at four-corners way back in 2003. There is one in each state (Az, Utah, Colorado, New Mexico). It is both generous and smart to leave something on the table when negotiating. It makes sense to quit while you are ahead. It goes against some of the popular wisdom, but maybe quitters can be winners. The effort involved to achieve returns in most enterprises follows a predictable “S” curve. It usually takes a lot of effort to get started. Then at some point it gets easier and you get into a sweet spot where you get a lot back for the effort you put in. As you get closer to 100% solutions, it gets a lot harder again. When the going gets really tough, the smart person quits and moves on to something easier. Sounds terrible, doesn’t it? But it is true and well known among those who study these things. The reason is the cost of opportunities. You only have so much time. The time you spend doing one thing is time you cannot spend doing another. Is it better to achieve 99 points in one place (99) or 90 points in ten places (900)? It is often harder to get the last 1% than it is get the earlier 90%. So just say no to perfection and yes to diverse opportunity. There are two inflection points on the curve. The first is where you are moving from the difficulties of start up into the sweet spot of easy returns. This is the place where loser-quitters usually throw in the towel. The second inflection point is where returns drop off. This is where winner-quitters wisely withdraw and move to greener pastures. So what is our advice? The best is usually not that much better than the very good. It usually just is not worth the trouble. AND those always pursuing the best almost always end up with the second rate. Do lots of things. Moderation in most things is the best advice. Quit when the going gets tough if you have other options; hang around if you don't, but don't complain. Below - back again in the USA for a couple weeks. This is the airport bus. I am back in the U.S. on my last R&R. I can easily see that my country that is prosperous, peaceful, clean and full of opportunity – and very green in Virginia. Yet all I hear on the news is how tough everything is. Maybe all those whiners should check out some other places. You really have to wonder about the points of reference. My point of reference is the 1970s, when I started to pay attention to things like jobs, the economy and the environment. Then like now, I was very concerned about the environment; it was a lot worse back then. Lest we forget, Lake Eire was declared dead and you couldn’t safely breathe the air in major cities. Many people seem unaware of the improvements and perhaps most think the opposite, but the environment is indeed better. So is the economy. In my economic courses back in college, I learned that unemployment of around 5% was “full employment” and almost impossible to sustain. I remember the stagflations and unemployment rates of 10%+. Of course, when I was apt to whine, my father would point to his youth during the 1930s. Now I hear that unemployment of around 5% compared to the Great Depression and economic growth of only 1% is called a recession. What great times we live in when such trouble we have is cause for gnashing of teeth. It doesn’t get very much better than this in terms of opportunity, despite what politicians are promising. Maybe that is precisely the problem - it doesn't get much better. Let me give a individual analogy. Alex has been working out for a year so that he can now toss around hundreds of pounds w/o much effort. He is worried re “plateauing”. It is a little sad to reach a goal, but at some point you are about as good as you can get. Society is not the same as an individual person. Experienced people understand that general conditions do improve – over time – and it is indeed possible for them to improve their own circumstances with hard work, patience and a little luck. But some aggregate measures will never get much better. It is not possible for unemployment to drop much below 5%. Some “problems” are merely tautologies. Half of all Americans will always earn less than the median wage, for example. And the weather is always bad someplace. If you look for reasons to be depressed you can find - or make - them, but why would you do that? What I take a bit personally is the rotten information being generally believed about Iraq. I could sum it up like this, “Let’s call our victory a defeat because it was harder than we thought.” There are movies and TV programs about Iraq, none of them show our troops in a good light. An episode of ER was on my flight’s entertainment center. It featured a crazy, drug addicted and mistreated vet. It turned out that he had gone nuts because he had seen so many Iraqis abused. What kind of crap is that? I saw a variation of that on “Law & Order” a couple of months ago. We have to call attention to this. Some people in the media seem to be working up the same type of slander they pulled on the Vietnam vets, only this time they pretend to care about them as victims. The true story of our success in Iraq would be more interesting. We have heroes. It is not even very hard to find them if you try. Our troops are not victims and they certainly are not perpetrators. They are doing their duty in a difficult environment and doing it well. For most, their time in Iraq gives them valuable insights and makes them better citizens. It is a hard thing to do. Doing the hard things reveals character. I blame the politically correct culture for these problems. We essentially have to downgrade heroism and bravery so that we don't imply those not exhibiting these traits are not as good. We let people revel in victimhood. In fact, it is legally enforceable. Somebody claims victim status and it becomes legally hazardous to give him/her a hard time – even when they have it coming. Who knows how the lawsuit will go with a credible (if deceptive) victim? It certainly is considered bad manners to tell the truth and it is politically dicey. When Phil Graham made his whiner comments, the whiners came out in force and whined that they were being called whiners. Of course, politicians distanced themselves from this and listed the many reasons why whining was appropriate. Is this the way it is going to be? I don’t think so. Most of the Americans I meet are still self reliant. Most of us still take care of ourselves; we pay our mortgages on time; 95% of our workers have jobs and they dutifully go to them. We grumble about how things are (grumbling is not the same as whining), but we understand that OUR efforts will improve our situations. But many of us have the impression that we are part of a small and dwindling minority that practices these virtues. We do indeed look like a nation of whiners, not because most Americans are whining, but because the whiners dominate the debate and everybody is afraid to say anything, sort of like the bystanders in the "Emperor's New Clothes" story. We all have to make choices and we never can get everything we want. This is probably a good thing, but no matter whether we like it or not, it is just how things are. It is nobody’s fault. I understand that I run the risk of becoming a curmudgeon, but I just don’t see the crisis the media tells me about. We face challenges – as always - which we will overcome and meanwhile life is not bad. It is just not perfect. If you find yourself is a perfect world, check your pulse. Who of us would want to live permanently in a different time or a different place? We live in a great country and it is a great time in history to be here. To pretend otherwise is dishonest and to believe otherwise is silly. Above are Mariza & Chrissy at Mariza's new place in Baltimore. I found the team leader conference in Baghdad very interesting and am trying to take some inspiration from it for my remaining time in Iraq. I was especially attracted to what General Petraeus said about the big idea and how working toward them attracts talent as people want to accomplish these sorts of goals. Below is a "gas station" in Hadithah. Not much to look at, but there was no fuel to buy not long ago. It is easy to get discouraged around here if we look at the things that are still lacking. But when I think about how much has been accomplished, the mood changes. Places like Hadithah, which were wastelands of rubble less than a year ago, are now enjoying growing prosperity and stability, with full markets and lots of economic activity. Our "good news story" is part of that, but only ONE part. The Anbari people are resourceful and resilient. They are going to make it and we can take great satisfaction that we helped. We are beginning to notice the effects of more Iraqi government money funding projects in the cities of Western Al Anbar. Projects are being built without our involvement. For example, the Al Faraby Primary School in Hadithah was an ITAO project. When USACE went to do site planning they found a GOI project already in full swing. Similarly I recently visited a youth Center in Rutbah. CA was planning to renovate it and the ePRT was supplying some soccer field improvements. I recently learned that our help was no longer needed as GOI was going to fund and work the project with a big budget. The effects are still uneven but unmistakable and they are bringing a subtle change in attitude. Local leaders are coming to understand that their own government, not coalition forces, is where they should look for resources. Effecting this change in attitude has been one of our key goals, but I am not sure how much credit we can take for it happening, sort of like the rooster taking credit for the sunrise. Certainly equally important are the fantastic oil revenues that the Iraqi government is earning as well as the perception among observant people that the U.S. Congress and the American people are less enthusiastic about continuing to push American money into a country that can well afford its own development. I was a little concerned to hear that the elections may be postponed. We hear from contacts that the people of Western Al Anbar are anxious to have their voices heard. They learned their lesson from the foolishness of their earlier election boycott and now want more representative politicians in power throughout the area. I am afraid that frustration will build as elections are delayed and people suspect that incumbent politicians are abetting in the delay to protect their own careers and prolong their tenure in their jobs. All tolled, I find many more reasons for hope than for despair. Iraq still has a very long and steep road to travel, but it is increasingly prepared to make the journey successfully. Above is a Marine playing golf during free time. You take what you can. At least that is how it used to be when Matthew Arnold wrote those words more than a century ago. I am speaking only of my own observation but I have noticed a change in society. I can recall when people doing bad things pretended to be good because they were rightfully ashamed of their bad behavior. Today many celebrities and athletes revel in their horrible behavior with apparent impunity. Being bad is now cool. It is something akin to the radical chic. Good people feel a little shy of admitting that they are not bad and cool. It is strange. We have in many ways reversed the earlier formulation. When I talk to my colleagues in Iraq, both civilians and military, it is clear to me that most people are here for good reasons. They came to do their duty, to serve their country and to try to make the world a better place. Of course there are also other reasons, but duty is the dominant, the predominant, motivation. It is the sine qua non of why we are here. My new team members feel a little reticent about admitting that. I did too. Why? The Marines really believe all that stuff they say about patriotism, duty & commitment and being around them has been both refreshing and liberating. I think we underplay the call to duty in our lives. Most people are looking for meaning. True happiness comes from doing what you should do. It need not be heroic or dangerous and it will be different for every person, but doing what YOU think you should do is what makes you happy. That means happiness cannot be found, bought or given; it has to be earned - too bad for rich heiresses and morality-challenged sports & movie stars. I am going to change my introductory talk to new team members to emphasize this a little more and give them more opportunity to feel good about what they are doing. Maybe I can use some variation of that speech John F. Kennedy gave re going to the moon, we do these things "not only because they are easy, but because they are hard, because that goal will serve to organize and measure the best of our energies and skills, because that challenge is one that we are willing to accept, one we are unwilling to postpone, and one which we intend to win…"
Or is that just too un-cool for today's ears? My ePRT is on the edge of the world. I realized this as we flew low to Baghdad in the Blackwater helicopter on the way to Baghdad. Marine Air flies higher and straighter, so I don't see as much, but there is not much to see anyway on my usual Western Anbar travels, just shades of dusty brown. As we flew toward Bagdad, I saw farm lands that were wider than a football field's distance from the river. Some of the land looked very green and rich. How different would my impression of Iraq have been if I had been somewhere else but Western Anbar? I went to Baghdad for the team leader conference. The thirty-one PRTs in Iraq represent vastly different human and natural terrains. Each of us sees part of the situation. It is good to try to bring us together to discuss the bigger picture. Below is our partner helicopter. Iraq has improved a lot since I arrive in September of last year. Our meeting reflected this changed situation. Back then it was sometimes hard to see a possible solution. Today I feel reasonably sure that we will succeed in helping this country become more democratic, stable and non-threatening. Our challenge now is how to help the Iraqis usefully spend their own resources on development projects. We were always supposed to be working ourselves out of a job. The preferred end state is a normal relationship between the U.S. and Iraq and we are well on the way. ... and a lot more green as you get farther from AA. During the conference I got a couple different perspective about Iraq. For example, Iraq had an excellent system of public health until the 1970s. It declined in the 1980s and got worse and worse as trained professionals left the country and facilities were no maintained. The promising news in this is that we are helping restore, not create a system. This is true of many aspects of this place. As one of the presenters pointed out, Iraq is not a poor country; it is a broken country that can and is being mended. The other different perspective I got came from the simply flying over the country and talking to my colleagues. There is more to Iraq than Western Anbar and there is a lot of potential. Above - animals grazing, palms growing along fields of grain. My impression of Iraq will always be Western Al Anbar, but I have to remember that is not the whole country. Picture below is from the Cowboy Museum in Oklahoma City. I stay out of specific politics on this blog, but now that both candidates have come down to nuanced but similar policies of staying in Iraq as long (or as short) as the need exists, I feel a little freer to ask what the hell is wrong with the American media? During the bad days in Iraq, not long ago, they were writing the American obituary. They had no trouble finding and quoting experts telling why we couldn't win in this sort of environment. Now they cannot seem even to notice success. Isn't that an extraordinary story? In the heart of the Middle East, on a battlefield chosen by Al Qaeda as their key front for their war against civilization, in a place where they proclaimed the beginning of their new caliphate we have driven them to virtual extinction. As they cower in their spider holes, fearing the arrival of our Marines or our Iraqi allies, their frustration is palpable. This was supposed to be their victory, not ours. They thought they had the weight of events on their side; they were mistaken. Why is this not story worthy of investigation and exposition by our esteemed journalists? My experience with journalists informs me that many, perhaps most, work from their existing models and do not actively seek out information that disconfirms them. They have a narrative that is generally accepted by other people in the media and that tends to constrain their perceptions. This is not something limited to journalists, but they are particularly susceptible precisely because they think they are not. The narrative that their conventional wisdom accepted was that Iraq was mostly lost and that we were in a holding pattern heading for a long term failure and withdrawal. They fixed the various data points around their narrative and the stories more or less made sense back in 2006. This narrative is now unraveling but the MSM has yet to figure out a new one to replace it. It is not a conspiracy, but it is a syndrome, a kind of a group-think. It will take a lot of changed facts and a couple of courageous leading journalists to break out. We have the changed facts on the ground; what we need now is the courage. BTW - I was reading one couragous journalist today. People who have been here recently know a lot more. Stay away from those pundits and bloggers who have been to Iraq years ago ... or never. I spend some considerable time complaining about the weather here in Iraq and who can blame me if you look at the pictures of the nearly opaque red air? But Al Asad has pleasant weather much of the year. November is very nice around here. Winters are a bit chilly, but never cold and usually clear. It is churlish to complain all the time. You just have to adapt. For example, in the summer it is much too hot for any strenuous activity during the middle of the day. The local Iraqis are active early in the morning and in the evening. They hunker down in the shade in the middle of the day. This bimodal activity optimal is probably the origin of the siesta. If you follow a similar pattern, (IF you can) you too are okay. I have been getting my running in before 0700. This time of the year, it gets light around 0430 and it is very nice at 0600. I get up in the morning and look out the door. If I can see a reasonable distance (i.e. dust is not so bad) I go out and run. There is an interesting aspect of the dust that I only figured out (maybe) recently. On some days the dust is not so bad at 0600, but it gets thick and unpleasant by around 0700. Some of this has to do with the nature of wind. The wind tends to pick up around dawn. I suppose it is because the earth heats differentially as the sunlight hits. The wind picks up dust and a short time later it is a mess. But not all the dust is natural. Much is kicked up by our own activities. Around 0600 the trucks & heavy vehicles start to roll in earnest; each creates a tail of dust and cumulatively there is a lot of dust. All this dust has to go someplace and it doesn't settle very fast. Most of the roads are paved with white gravel and I am pretty sure our activities are the source of much of the whitish "moon dust." The red dust comes from farther away. Our weather maps show massive clouds, sometimes covering almost all of Iraq. The most recent attack of the red dust originated in the western deserts of Iraq and in Syria. This kind of weather pattern is usually associated with a northeastern wind. Our local activities can create local unpleasantness, but the real dust storms are those caused by Mother Nature. Of course it is not all Mother Nature either. People have abused this land for >4000 years. Much of this dirt would have been held down by the roots of plants had humans and goats not uprooted them. I blame Dennis, our AG Advisor, for the current problem. He has been here nine months and still not managed to cover the hills with grass and reverse the mistakes of the last four millennia. BUT today is nice. The air is clear and the morning was cool and pleasant. We are supposed to have at least three days of this before the next clouds of dust obscure the horizon. I have to get my running in while the running is good. I made the three and a half minute trek to the highest mountain in Al Asad, an elevation of at least 30 feet, and took the pictures. This is as good as it gets around here. We are experiencing the mother of all dust storms. The dust is more red than usual. Satellite maps indicate that the storms are starting in Syria. I wonder if that qualifies as a Syrian incursion into Iraq. Below is me in the dust storm. I went out to stand in the dust as you can see in the picture (or almost not see). You have to be in on the experience after all, the bad ones too. The dust stings your nose and eyes. I can only imagine how it would be to be exposed to it all day w/o shelter. It quickly dries out you mouth. We are not suffering too much, however. Our new headquarters is fairly well sealed since it was renovated. This is a big change from the old building and a quantum leap from the tents. During previous dust storms, it just rained dirt inside our building. Today I can observe it out the window with some measure of detachment. Coming out of the shower this morning was interesting. Of course, we don't have showers or toilets (what the Marines call heads) in our cans. I am lucky in that my can is only a short distance from the showers/heads, so I can make the trip in flip-flops and running shorts. I don't usually bother to dry off very much. It is unnecessary. Stepping out into the Anbari summer wind is (as a Marine colleague described it) like being sprayed by a giant hair dryer. Today I had the added experience of fine red dust blowing in the wind. I was coated like a Christmas cookie by the time I got back in. I exaggerate only a little. This is us coming back. This gives you some idea of the distances involved. On the plus side, dust storms reflect the sun's heat, so it is a lot cooler sheltering under the dust blanket. But it cannot be good for you. I didn't go running this morning. I don't think it is healthy to run in this pea-soup of dust. I was thought I would be encased in concrete with cement lungs, probably in mid-stride, turned into stone sort of like after seeing the Medusa, but when I look at the dust blowing around, I understand that it would probably be the much more attractive terra cotta. Maybe that is how those famous Han Dynasty soldiers came to be. BTW - I submitted by essay re success in Iraq to the official State Dept blog (blogs.state.gov). They broke it up into bite sized pieces and have not yet published the whole think, but please have a look.